Every pretext that can be advanced to palliate idolatry, is in the possession of a Chinaman. He propitiates evil spirits by land and sea-he deifies innumerable natural objects, and constructs divinities for his adoration by the assistance of art. Sacrifices and oblations continue to be offered, as if the one great atonement had neither occurred, nor been promulgated; and the earliest practices of ignorance are observed with a tenacity worthy of the world some two thousand years ago. Such sacrifices are divided into three classes-great (ta,) medium (choong,) and lesser (seaou.) Amongst the second kind are those made upon the gathering in of harvest, which are accompanied by the genial quality of gratitude-a gratitude, however, which the display of an all-powerful Providence, in the production of an abundant harvest, can scarcely fail to obtain from man in every state of his existence, from his entire conviction of the vanity of all human efforts, unaided by the benevolence of his Creator. When the day of the full harvest-moon arrives, Chinamen, wherever they may be, or however engaged, with a sort of Mussulmar scrupulousness, make their oblations to the gods of grain and of land. In every city, usually where the highways meet, this offering to the Chinese Ceres is made. Generally a rude stone is set up for a harvest-god, before which incense is burned; and logs of wood, hewn into imperfect resemblances of the "human form divine," are placed around, to represent rustic deities, local genii, tutelar gods of agriculture, horticulture, and rural occupations; these unsightly effigies being, in some instances, most audaciously imposed upon spectators as appropriate representations of the sun, moon, clouds, winds, rain, and thunder. 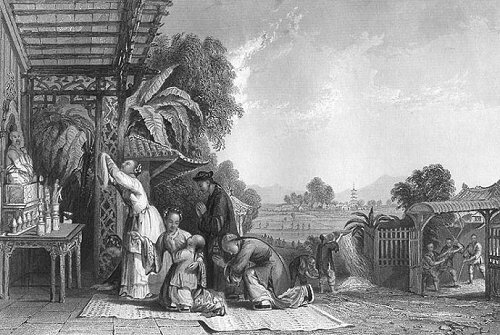 the Chinaman holds his agricultural festival, unimpeded in his religious duties by the claims of those that are temporal; the labours of the barn, performed by the swingel-the operation of winnowing, in which a bamboo sieve and spacious cotton sheet are the only implements-and the preparation of the fields for another crop of rice, all " go bravely on," while the family, in the attitude of prayer and thankfulness, are engaged before the altar of their rural gods. In the vicinity of the farm-buildings, but always in an open position, a portico is constructed, in a style of peculiar neatness, for the reception of the image selected by the patriarch of the family. A table in front of the niche in which the rude figure is set up, serves as an altar on which flowers, and pastiles, and tapers, are ranged, with cups of rice or tea. Here, before this most contemptible mockery of intelligence and power, the mother of the family presents herself, holding in her apron such produce and grain as she deems most suitable for a first-fruits offering. Behind and beside her, on a mat spread out before the rustic temple, her husband and children attend, and second her entreaties that the offering may be accepted, by prostrations, genuflexions, and silent prayers. This surely is a scene of gratitude and affection: it implies the presence of the finest feelings, it is exemplary in its observance, and the actors betray the influence of no motive that is susceptible of an anti-moral tendency. Is it not therefore encouraging to those whose Christian duties demand the diligent exercise of their abilities in expelling the long night of idolatry from China, by directing the rays of Christianity to shine upon the land, to perceive, that there, too, are hearts that can be moved by a sense of obligation-souls capable of appreciating the benefits conferred upon them by an unknown God-minds prepared by custom, habit, practice of long continuance, to receive a just account of the relation that exists between the Creator and the creature, and to acknowledge the eternal obligation under which the merits of a Redeemer have placed the whole human race, from the beginning of the world till time shall be no more. The accompanying view, which represents a rice-farm a few li from Yang-tcheou, is remarkably characteristic, conveying a most full and perfect representation of the national habits and local scenery. A town of the third class, with its pagoda towering over it, fills the remote distance; the rice-grounds, in preparation for a second crop, occupy the middle; while the harvest sacrifice, and reduction of the crop just saved to a marketable state, take up the whole foreground of this epitome of utilitarianism. In this little scene, that cannot be viewed without an affecting interest-without increasing, or rather creating, a respect for the character of the rural population of this vast empire, the appropriations of the national tree, the bamboo, are more than ordinarily conspicuous. The shed, and gates, and fence of the threshing-stall are of split stems; the sieve used by the winnower, the large mat on which the family are kneeling before the altar, the hat worn by the patriarch, the table under the portico, and the entire of the temple itself, are composed of the stems, or the canes, or the fibres of this invaluable vegetable production. This image and commentary refer to what we usually translate now as Mid-Autumn Festival, which you can read more about at China The Beautiful.